Peel skin off sweet potatoes. Slice two sweet potatoes into one inch rounds. Toss them lightly in coconut oil and salt and pepper. Cover a baking sheet with a light layer of coconut oil. 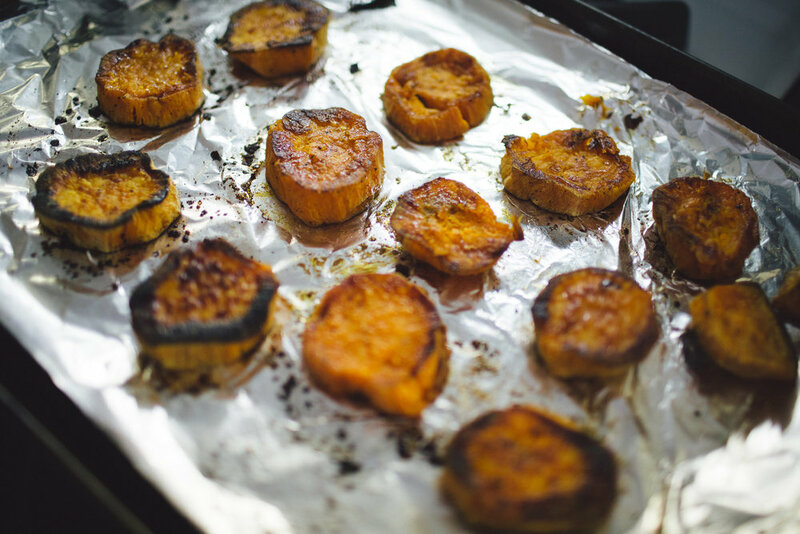 Lay the sweet potatoes on the baking sheet with enough space between them. Place the baking tray and the foil wrapped sweet potato in the oven. Turn the slices of potato over after 30 min and let cook for approx. 1 hr total until brown and slightly crisp on the tops and bottoms. Remove and set aside. While potatoes are cooking, slice the onion into rings and lightly grease a frying pan with olive oil. Cook onion until caramelized – golden brown and soft, approximately 15 minutes. Toast slices of Ezekiel Bread. 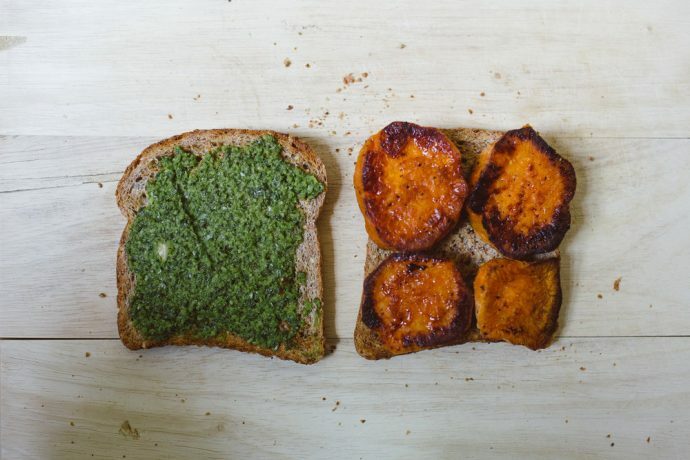 Assemble the sandwich by applying a thick layer of harissa sauce to once slice of bread, then add in rounds of sweet potato- approx. 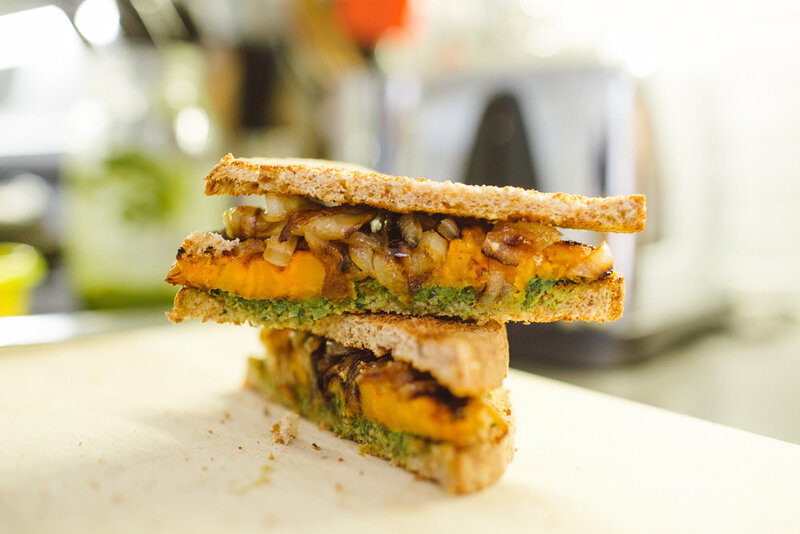 4 per sandwich – top with onions and the other slice of bread. Cut sandwich on a diagonal and enjoy! Add the parsley, mint, cilantro, garlic, jalapenos and lemon juice to a food processor. Add in about ¼ cup of olive oil and begin to blend. Continue to blend adding olive oil in as needed. Consistency should be that of a relish. Season with salt and pepper as needed. *for even more heat in your sauce, add in another jalapeno. Stores in fridge in air tight container for approx. 2 weeks. Wrap one of the sweet potatoes in about a 10×10 square of tin foil. Repeat this step. Let it cook for approx. 1 hour or until it is soft when you press in. Carefully open the tin foil and let the potato cool slightly. Place the potato on a plate and with a fork mash the entire potato flat. Continue to let cool. Once cool, store the smashed potato either in small air tight containers in the fridge or you can fill an ice cube tray with the potato, cover with foil and freeze for future use.